There’s a lot to love about the mountains of Iran. 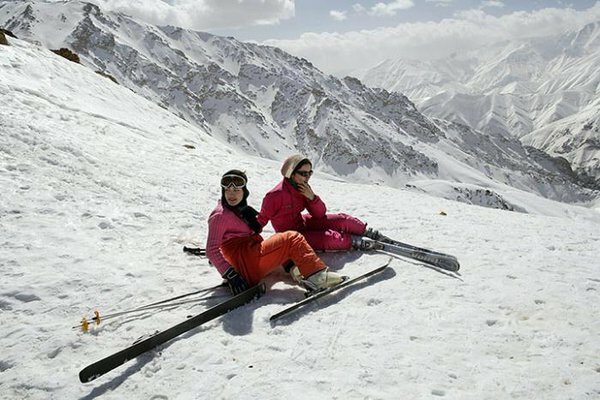 The country’s most popular ski area, Dizin, is a two hour drive north of Tehran and the season runs all the way through until late May. The resort is high, super high, 4000 metres high and it also faces north which means loads of dry, light, powder snow. As the air gets thinner, so do rules regarding the head dress, or the ‘hijab’. Don’t expect to see women skiing with anything other than beanie and goggles. It’s standard ski attire throughout the resorts. Lift tickets for the largest ski resort, Dizin (opened in 1969 under the Shah), will set you back $30 a day. That gives you unlimited all day access to the mountain. Join the locals at popular mid-mountain restaurants for a bustling cabin style affair, or you can seek out the inconspicuous bunker style “bar” towards the top of the mountain for the real Iranian snow-scene vibe; snowboard/skiing movies, a rooftop deck and delicious home cooked food. What more do you need? Gear hire is equally affordable. In saying that, I’d look at bringing your own. Most of the equipment for hire is made up of 80s style skis and limited snowboards. If you are planning to ski at one of the smaller areas (Shemshak or Darbandsar), bringing your own jacket/pants/gloves is a must. Sticking to Dizin, you’ll be able to get what you need, you just wont have the options available in Europe, America or Japan. Why not book one of our beautiful flats or challet in Shemshak, which is located between the two other resorts.